Lisa Klink has been a Special Education Science Teacher at Schuyler-Colfax Middle School in Wayne, NJ for four years, but her love for animals dates back much further than that. As a child, Lisa began advocating for animals when she visited the Mt. Pleasant Animal Shelter in East Hanover, NJ as a member of the Girl Scouts.She began helping socialize the cats there, as well as cleaning toys and bedding for the animals… and, amazingly, she never stopped! As an adult, Lisa remains an avid volunteer at Mt. Pleasant Animal Shelter; socializing cats, walking dogs, fundraising and sponsoring incoming dogs. Lisa and her husband, Steven, also volunteer for Australian Shepherds Furever, providing transport for Australian Shepherds to travel from crowded shelters across America to their foster or forever homes. 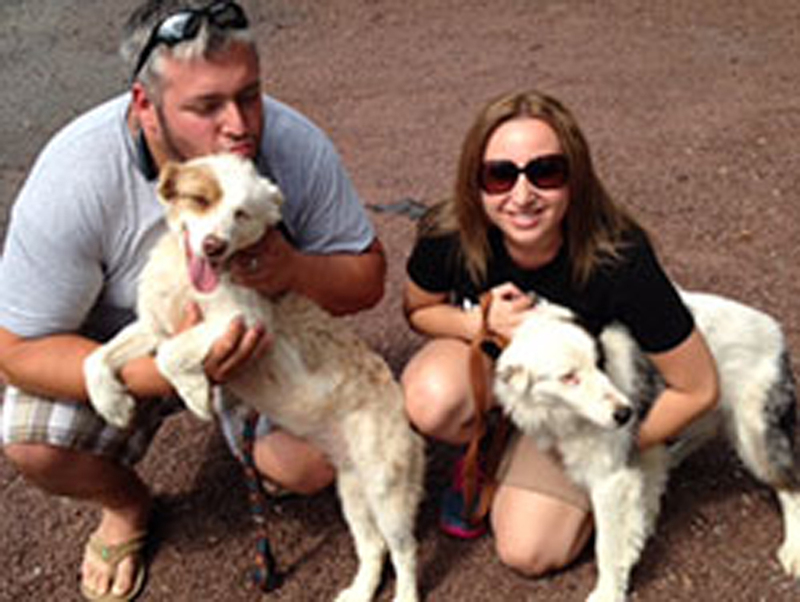 In fact, just this September, the pair drove from Pennsylvania to Connecticut to help transport two double merle (blind and deaf) Australian Shepherd sisters to a foster home in Massachusetts. Helping animals in need has truly been a lifelong passion for Lisa; so when she began teaching at Schuyler-Colfax, she immediately went to work integrating compassion for animals into her classroom lessons. She organized assemblies and field trips to shelters, aquariums, and zoos in the hope of introducing students to animals they might never have otherwise interacted with in a science setting. However, it wasn’t until this past May, when she heard about a local cat, named Quattro, who was beaten to death by elementary school students, that Lisa really began her journey to make animal compassion a part of her everyday teaching. Quattro’s story left her in shock. Not only was an animal lost to a horrible act, but it was carried out by children from a neighboring town. Lisa knew she had to take this event and turn it into a teachable moment for her students. So, she reached out to Renee Olah, owner of Chance at Life Cat Rescue, to thank her for trying to save Quattro. Then, Renee and Lisa held a joint assembly together at Schuyler-Colfax Middle School to give educators and students a first-hand account of the animal cruelty that was committed and then start a discussion about what they can do to prevent anything like that from happening again. 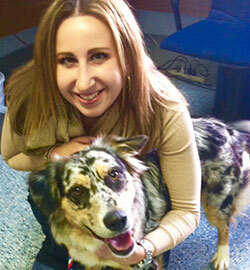 Lisa and her students gave life to a project, known as Quattro’s Paws for Hope. Students create pledges against animal cruelty on paper paw prints, string them together with ribbon, and donate the laminated chains to local animal shelters and rescue groups to show that the future generation will do their part to ensure that animals are shown compassion. Lisa’s students gifted their first chain to Renee. Since then, Lisa and her classes have donated ten chains to animal shelters and members of the community who have dedicate their lives to helping animals. Lisa’s class has spent a good deal of time discussing the similarities between people and Mutt-i-grees. She uses the example that mixed breed dogs and cats are just like humans that have parents from two different ethnicities. Lisa explains that she is like a Mutt-i-gree because her father is from the Ukraine and her mother is from Italy. The students then research their own ethnic backgrounds and animal breeds to see how they parallel. She says the students enjoy this activity because they’re able to look up their favorite breed of dog or cat and see where their roots are from. Lisa says that Mutt-i-grees has been a wonderful addition to her school and classroom. Her principal and superintendent have been supportive in bringing Mutt-i-grees to her school district and teachers have expressed interest in learning more. Lisa explains, “Teachers across our district believe in the fact that while students must learn their academics, they must also learn to be kind, compassionate people. It has definitely unified and widened our thinking on education and child development.” Lisa plans to further her impact by spreading the word about her use of the Mutt-i-grees Curriculum with the Wayne school district as a professional development opportunity. And her ultimate goal is to bring national recognition to teaching respect and kindness to all creatures in schools. Keep up the great work, Lisa!